Your job in the OR can be challenging. We want to help. 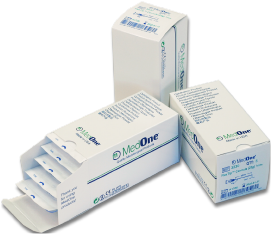 At MedOne we focus on making products that help you help your patients. Attention to detail and a quality focused approach result in products you can rely on in difficult situations. Our innovative products help solve problems and consistently achieve great surgical results. We share your passion for patient care. It drives everything we do. Our engineering team designs and develops products optimized for surgical success. A rigorous quality management system ensures products perform as expected, every time. Specialized ophthalmic distributors around the world are ready to support you. MedOne Surgical, Inc. develops, manufactures, markets, and distributes high quality specialty surgical products worldwide. Our primary focus is on single-use products for vitreoretinal surgery, including specialty cannulas, backflush instruments, and related devices for retina surgery. We also offer a small range of products for neurotology and skull base surgery.